Schools, and other educational groups are the mainstay of our delivery. 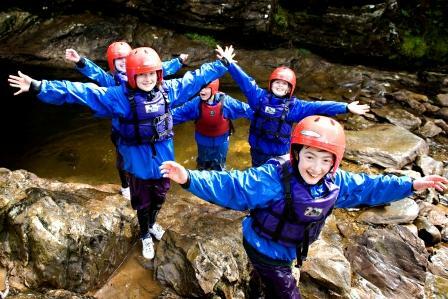 We operate year round during term time - mainly with Fife Primary School groups, but work with most local authorities in the Central Belt, and even as far as the Lake District. We believe Ardroy is different to many other outdoor providers as we are outcome centred, not activity centred. It is not what the pupils do at Ardroy, it is what they learn from it. Schools generally come for either a five day Mon-Fri course or a four day Fri-Mon weekend. We work on a 1:8 instructor/student ratio (1:9 in winter), and the same instructor works with their group throughout the course, ensuring a mutual relationship of trust can be established. We can only achieve this by employing instructors who are qualified to deliver all the activities we offer. We review every activity with the children, focusing on what they have learned, and how to apply it to the next challenge. A full evening programme is included in the cost, we keep them busy and learning right until bed time! Don't take our word for it! Click here to see an audio slideshow about Commercial PS in Fife, with staff talking about the impact a week at Ardroy had on their pupils. To help decide which theme to choose please look at our themes for schools courses page, which details the content of each theme, as well as other aspects of our educational delivery.